It’s that time of the year again. It’s time for Google Think Dealer 2017. With a new name, a new focus and a couple new locations, Google has released dates for their Canadian automotive event across the country. It’s safe to say we’re stoked; You should be too! Previously titled Think Auto, Google has segmented their events to separate dealer and OEM focused content. The name for the dealer event, Think Dealer represents exactly that. Content is specific to Dealers: The content is designed, conducted and built just for dealers. 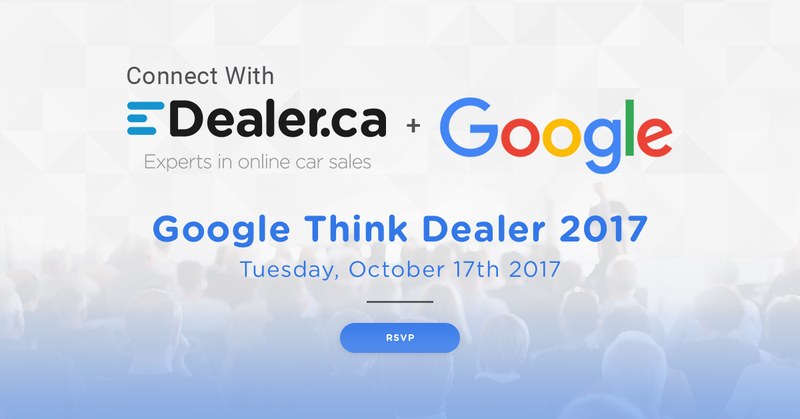 You will hear from Google and external speakers on results for Canadian Dealer Research. It is what dealers and their OEM have been pushing for: Dealers have pushed for years to have us expand the focus beyond the OEM (Tier 1 & Tier 2). We are finally delivering the promise of running a dealer specific industry event. We are taking the insights to the dealers, across the country: Rather than having dealers converge at one city, we are bringing the research to them, across the country, from Halifax to Vancouver. This will save dealers tons of time, money and effort to attend. The Google auto team will share exclusive Canadian auto research, consumer trends and how to make the most out of your search, display and video campaigns. Ready to pull the trigger and sign up for the closest Think Dealer event? Capacity will be limited and spaces will be first come, first serve. So register ASAP! EDealer will be attending the Toronto event on October 17th and we hope to see you there! If you can’t attend in person, keep a close eye on our social channels during the event as we’ll be doing plenty of posting throughout to give you the most important Think Dealer information as soon as we can.